You are here: Home / Interiors / INTERIORS – what do people want from a new kitchen? INTERIORS – what do people want from a new kitchen? So what do people want from a new kitchen? “Everything!” cried kitchen designer Hayley Tarrington-Robson, when on the panel at a recent home design seminar, hosted by Homes & Gardens magazine. In times gone by, they explained, clients looked very much to “the experts” to start the ball rolling and initiate the design process. Now it’s different. “Clients today know what they want, because they have many more tools to help them visualise and research,” Hayley said. She is talking in particular about Pinterest, the website for sharing ideas and creating files and moodboards, and Instagram, where people see and share design ideas in the time it takes to snap and click. Houzz (www.houzz.co.uk) is also hugely popular. This website was launched in America in 2009, and came to the UK in 2014. It offers thousands of professional photos of interiors, exteriors and gardens, daily newsy editorial, and a comprehensive directory of interior design products. It also puts users in touch with over 35,000 home improvement experts, and with hundreds of thousands of other UK-based homeowners. Hayley ‘s clients also love the home interiors magazines, and their websites, specialist TV shows, and London’s numerous design shows. “It’s so much easier for my clients to show and tell, rather than try and explain with words only.” She encourages clients to take reference photos on their phones, and to build moodboards on Pinterest, which she can share online. And to collect tear sheets from magazines, and pick up colour cards and samples wherever possible. Hayley ticks off a typical new kitchen wish list. (There’s plenty of scope: a recent survey by Houzz found that around three quarters of kitchens being renovated had not been touched for ten years or more. However durability and longevity were cited as key criteria). Top of the pops is an open plan layout, combining living and dining space. Hayley calls this “fused living”. Yes, it’s all about space, she explains, and ways of finding new volumes of space and maximising natural light, at the same time merging outdoors with inside. “Of course it goes without saying that a kitchen must be functional – and that’s where our expertise really comes into play.” However, even here, clients are now very specific – they’ve seen steam ovens, induction hobs, griddles, juicers, bread ovens, sous vide, and touch controls on TV, and they want the latest appliances. “People are cooking and entertaining more at home, they want machines that make cooking easier and more professional,” adds Hayley. Extraction is also critical in open plan kitchens. Hayley loves a new product called Bora (www.bora.com) that combines the hob and extraction, creating a cross flow of air at a greater speed than the rising cooking vapours, to capture fat and smells before they even get airborne. This is perfect for an open plan kitchen where cooking is on an island. And the space above remains clear, for a decorative pendant or a feature skylight. Islands themselves are now a key component, adds Hayley. “They can create a sociable workstation usually for cooking and for an informal seating area.” Other experts from around the trade concur, and contribute some pointers of their own. Vincent Glue is senior designer at Smallbone – perhaps the best known and most prestigious of all British kitchen brands, dating back to 1975, when they pioneered timber handmade kitchens that were more an assembly of hand painted dressers, chests, shelves and cupboards than a “fitted kitchen”. Solid wood was lovingly adorned with a variety of “paint effects” – dragging, stippling, marbling, colour washing, all finishes which are having something of a revival. Even now, each Smallbone kitchen will carry the label of the joiner who made it. Today the Smallbone look is sleek and modern (indeed their latest kitchen island design is called Modernist), with a flagship showroom at 220 Brompton Road, Knightsbridge, SW3. In Battersea, the recently refurbished Hub Kitchens specialises in sleek Italian ultra-modern kitchens complemented by top German appliances – for example The Cut, designed by London-based architect Alessandro Isola and produced by Record è Cucine, exclusive to Hub Kitchens. (www.hubkitchens.com) Says co-founder Daniele Brutto: “Customers want islands to be the focal point for the kitchen. They like the island to make a statement, either with bespoke design, standout colours or by combining finishes. The island works best when it is a multi-functional piece of furniture. It should become a go-to area for cooking, eating or entertaining. Flexibility is key, often an island will include a pullout table for alternative eating or office space and the best island designs create a hub for different lifestyle needs”. An island can be an exotic design statement. During the London Design Festival Italian kitchen specialists Boffi installed the Cove kitchen by the late great architect Zaha Hadid. Billed as a “monobloc”, this sculptural unit with its sweeping curves has areas for cooking and washing combined with space for “socialising.” It comes in two sizes in a choice of exclusive finishes including Corian, natural stone and wood. You can also see a 7m long kitchen island by German designer Norbert Wangen, with units in elm, doors in black “ecowood” and worktop in a stunning black marble. Boffi Chelsea is at 254 Brompton Road, London SW3. Running alongside the trend for islands is the revival of the larder. So much food, including cheese, fruit and salads, tastes better if stored for at least a short while out of the fridge at room temperature. Vincent Glue of Smallbone is also a larder expert. 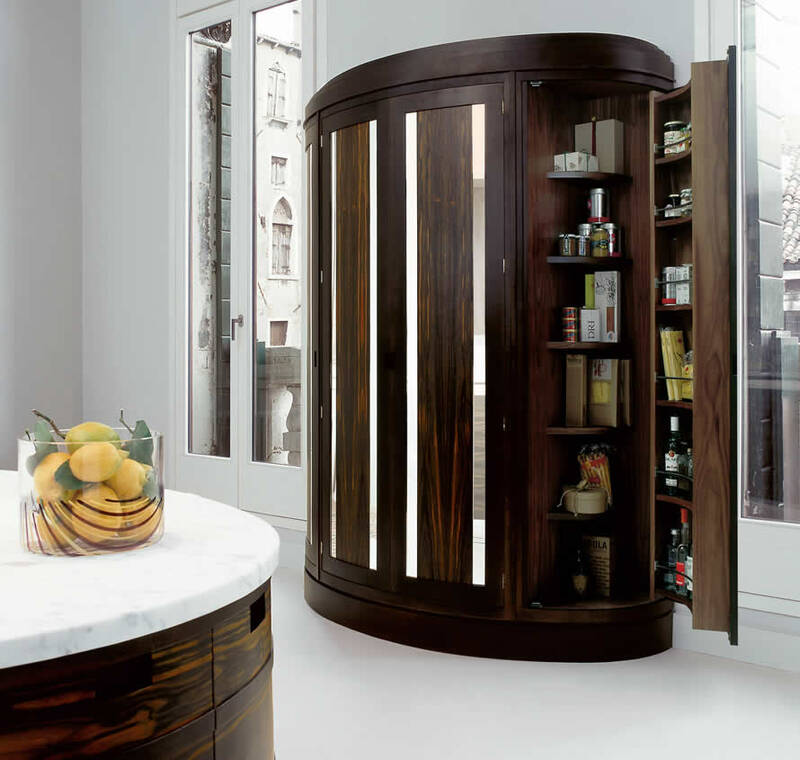 The simplest larder, he said, was a tall cabinet designed to hold food, but now clients are demanding much more. But let Hayley at DayTrue have the last word on kitchen aspirations: “Choice of materials is so much more adventurous than it used to be. And people want to mix materials in the same installation – different types of woods (pine, oak, walnut, ash, plus exotic veneers), metals (from dull bronze to glowing copper and shiny stainless steel), and stones, from dramatic marbles to flecked granites, dull slates, and creamy limestones. Plus a touch of concrete for that industrial look. Surrey Woodburners, the Surrey wood burning stove specialist with a showroom in Woking, has established a reputation for high quality, personal service and has now extended its product range with the ESSE range cooker distributorship. ESSE has been handcrafting British cookers since 1854 and has been the choice of clients including royalty, the Savoy Hotel, the River Cottage restaurant and the explorers Shackleton and Scott, who took them on their Antarctic expeditions. While traditional quality is at the heart of the collection, there’s nothing old-fashioned about it. The ESSE range cooker has continued to evolve in an era where energy efficiency is all-important. There are models with four ovens and an induction hotplate, designs that don’t need a flue and wood burning ranges that dramatically reduce electricity consumption. ESSE cookers continuously maintain their oven and hotplate temperatures and many models can also provide central heating needs. Some models can be controlled by a timer.